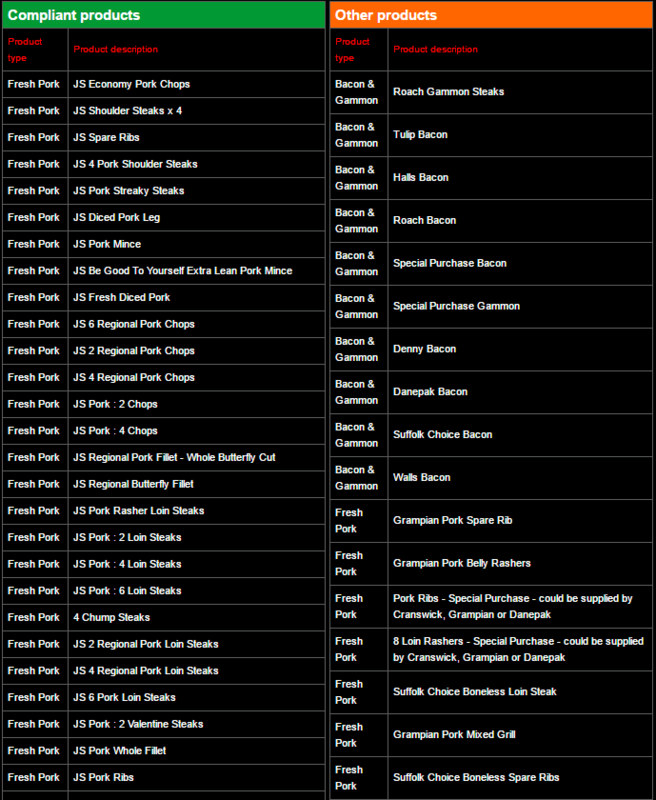 All own brand fresh pork is British pork and carries the Quality Standard Mark. All own brand Fresh Sausages are made from British pork. Own brand bacon is produced from either British pigs or pigs reared to UK equivalent welfare specifications in Denmark or Holland. With the exception of Square Cooked Ham and JS Wafer Thin Ham, own brand ham is produced from either British pigs or pigs reared to UK equivalent welfare specifications in Denmark or Holland. The retailer is currently reviewing its sourcing policy with regard to its square cooked and wafer thin ham ranges. With respect to branded products, the retailer does not have direct control on the raw material specification. Such products do not carry the the retailer’s brand on their labels, and are likely to bear manufacturers’ brand names or to be labelled ‘Special Purchase’, with the name of the supplier on the label.